On the left is our Ninja blender filled with a typical smoothie's worth of ingredients. We are too cheap for a Vitamix (but might cave in! ), and this works extremely well. Top right is what I had this morning. I have gotten in the habit of making a work week's worth of smoothies on Sunday and freezing them. I take one out right before bed and put it in the fridge. By the time I get to work it's usually ready to eat. Middle right is my post-long run treat smoothie served in a bowl topped with fresh fruit and homemade granola. Bottom right is a typical weekend or non-work day smoothie made fresh. The fresh smoothies are definitely my favorite, I make them so they have the consistency of a thick milkshake. 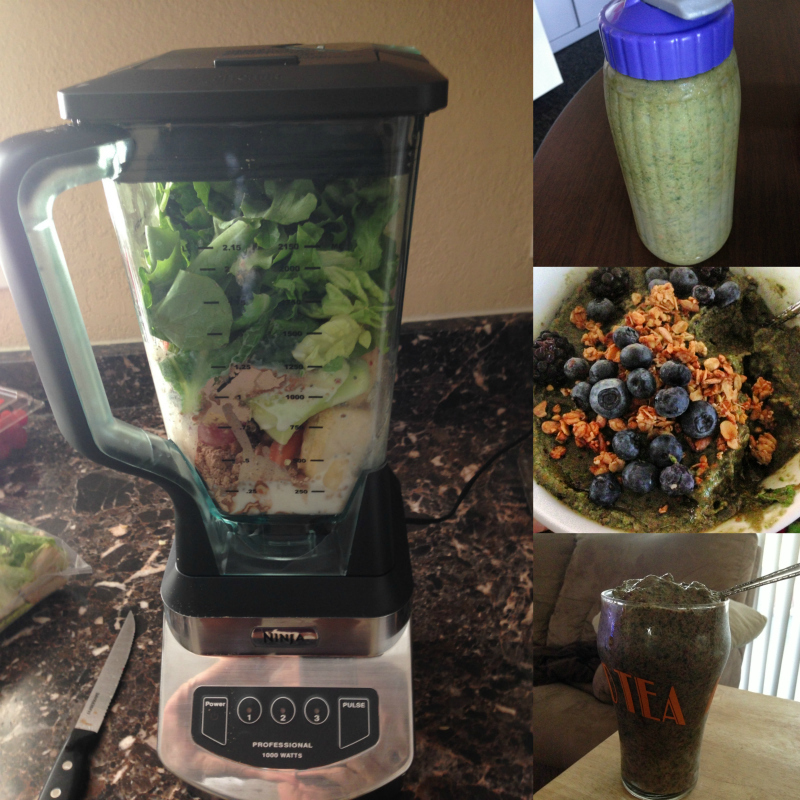 Most of my smoothies are very similar and I wanted to share my typical smoothie recipe with you. I began my smoothie habit in the winter (which was hard!) and I've come to realize that they fill me up and keep my body working better than any other breakfast option. Some days I still eat granola with berries, oatmeal, pancakes or toast with nut butter for variety but I'd say at least 6 days a week I have a smoothie. Here's my usual recipe. Since I have the nice Ninja I put everything together. I usually put the frozen things on the bottom, top them with any powders/spices, then add the fresh greens and milk last. The fresh smoothies usually take some time to blend properly and I often stop and scrape down the sides with a spatula. Not every smoothie I make has the above ingredients. I try to mix it up based on what we have, what I'm in the mood for and what we have in the house. One of my favorites is to do a simple blend of banana, broccoli, carrots, greens and peanut butter. I am a big fan of using food as medicine and I always include cinnamon and ginger in my smoothies due to their anti-inflammatory properties. I try to have cherry smoothies after long runs because cherries are also great for anti-inflammatory. I used to use tylenol, aleve & ibuprofen on a fairly regular basis, but now I only use them if I'm desperately ill (like last week!). Speaking of my illness, today was my last antibiotic. I'm excited for tomorrow because I have a fridge full of kombucha that I've been waiting to drink until after I'm done with antibiotics. I worked out for the first time in a week this morning and I was so pumped to get up this morning! I did one of my usual strength routines and it went better than expected although I did make sure not to push myself as hard as I normally would. I am hoping to get in a 3 mile run tomorrow. I love this formula - and I never thought to add some of those ingredients! This sounds delicious!